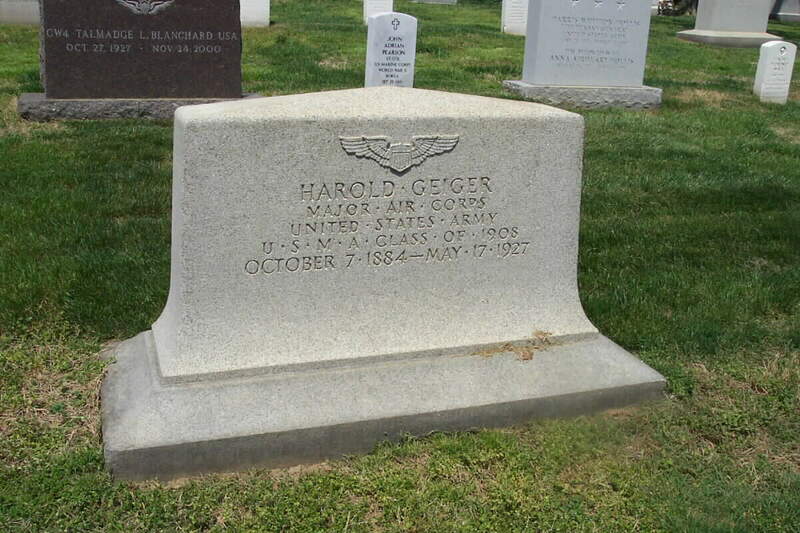 Harold Geiger was born on 7 October 1884 and was a 1908 graduate of the United States Military Academy. He served in the Army Air Corps and died on 17 May 1927. He is buried near William Dodd Geiger, Major, United States Army Air Forces. We are seeking additional information regarding Major Geiger. Graduated from U.S. Military Academy at West Point; Major in U.S. Army; Charter member Caterpillar Club, Air Service; oversea service in World War I. It was autumn 1912. The Army aviation unit was scattered between College Park, Maryland, and Augusta, Georgia. Glenn Curtiss still had tenancy of North Island. He invited the Army to share the island and the offer was accepted. The first detachment arrived November 4, 1912. It consisted of Sargeant James Hartman, Signal Corps, in charge of eight enlisted men. About two weeks later, the Detachment Commander, Lieutenant H. Geiger, Signal Corps, arrived and took charge. Additional personnel arrived shortly thereafter. The Signal Corps unit cleared a runway and established a camp on the northeast end near where the Navy "Camp Trouble" had been located earlier in the year. The first two airplanes were received from College Park December 15, 1912. They were a Curtiss 60 horsepower and a 40 horsepower "Grasscutter" training plane The Wright machines remained at Augusta. While Harold Melville Clark was getting his Army wings, the Signal Corps' aviation section and military aviation in general was getting a troublesome start in the Hawaiian Islands. 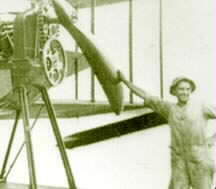 The first Army airplanes, pilots and crews arrived in Oahu in July 1913. The planes were based at Fort Kamehameha, near present-day Hickam Air Force Base. Lieutenant Harold Geiger, who commanded the aviation assets, arrived in Oahu with "two Curtiss float planes, a Curtiss Aeroplane Company mechanic, 12 enlisted men, canvas hangars and other support equipment," as William Dorrance wrote in Fort Kamehameha: the Story of the Harbor Defenses of Pearl Harbor. However, Geiger's aircraft were in poor shape. His flights were limited to short flights in Pearl Harbor and a longer flight to Diamond Head and back to Fort Kamehameha. Geiger was ordered to cease all flying operations in late 1913. The planes were sold locally, and the engines were sent back to the North Island Flying School. The Hawaiian Islands wouldn't see any more Army aviation activity until 1917. These paragraphs, which refer to Harold Geiger, were extracted from the complete story which is found on the Wings of the Signal Corps: the story of Major Harold Melville Clark website, by Captain Kevin Romano. Harold Gieger was married to Frances Bridges in San Diego on Saturday, September 19, 1914. He had earlier returned from Hawaii in February 1914 to visit her. Lieutenant Walter R. Taliaferro, Junior Military Aviator, was his best man and met his future wife, Liecester Sehon (yes, Liecester, her father's middle name), a bridesmaid at their wedding. This is covered in Edward Lieser's book "San Diego Aviation History1883-1916" Chapter 17, page 7,which is available at the San Diego Aerospace Museum Research Library. Harrisburg, Pennsylvania - May 17, 1927 - Apparently only slightly hurt when his De Haviland plane took a fifty-foot nose dive, Major Harold Geiger, commandant of Phillips Air Field at Aberdeen, Maryland, could not extricate himself before the machine burst into flames and he was burned to death at Olmstead Field, near here, at noon today. Six mechanics and officers of the Middleton Air Station saw the plane rise gracefully on its return to the Aberdeen Field, then suddenly plunge, nose downward. Major Geiger had the presence of mind to release his safety belt and leap out when the plane struck, they said. The instant of the crash, as the machine swung over on its wing, eighty gallons of gasoline from the fuel tank burst into flames, covering the ship from end to end. Major Geiger made desperate efforts to get clear of the wreckage and, according to the onlookers, half crawled and ran as far as the tail of the machine before he was overcome. There he dropped and the flames prevented the watchers from getting near enough to rescue him. His body was recovered, lying under the rear part of the fuselage, when the flames has been put out by the officers and men of the depot. Major Geiger had flown here this morning with Lieutenant Steele, who was to take back to the Aberdeen Field a Curtis plane which was being reconditioned. Geiger, in a No. 4 De Haviland, took the air expecting Steele to follow him, and had risen hardly more than fifty feet when something went wrong and the plane went into a dive. The accident is the first fatality at the Middleton Field since six years ago, when Captain Donald J. Neumiller, attached to the field, was killed when his plane struck an air pocket belt and leap out when the plane struck, they said (sic). "Why is Spokane’s designator "GEG"
In 1941, the Department of the Defense purchased the area then known as "Sunset Field" from Spokane County for a World War II B-17 and C-47 training facility. Following the acquisition, they renamed the facility Geiger (GEG) Field in honor of Major Harold C. Geiger, a pioneer in Army aviation and ballooning. In 1946, a portion of the airfield was designated a municipal airport, and commercial airline operations were moved from Felts Field to Geiger Field. In 1960, the facility was renamed Spokane International Airport." The United States was slower than France in issuing pilot's licenses and establishing the rules under which they could be granted. Regulations published in 1910 stated: "All candidates shall satisfy the officials of the Aero Club of America of their ability to fly at least five hundred yards, and of their capability of making a gliding descent with the engine stopped, before their applications will be entertained. Up to the time of Belmont Park, twenty-five such licenses had been issued. Major Harold Geiger, who was killed today when his plane was wrecked and burned, was a World War veteran who had served as a Lieutenant Colonel in France, and had been attached later to the Ambassador's staff in Berlin. While in Germany, Major Geiger sent reports to the Chief of the Army Air Service in the construction of the dirigible Los Angeles, then the ZR-3, and repeatedly urged that the craft, which was later taken over by the navy, be purchased for the army. He was on the ZR-3 on its transatlantic flight.